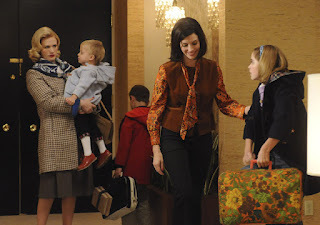 "Mad Men" Review: "Dark Shadows" (Season 5 Episode 9) - "Refreshing for the Damned..."
The masterful fifth season of Mad Men continues with episode 9, “Dark Shadows,” and as always, I’m here with my weekly review and analysis. To do the hour justice, this review contains heavy spoilers, so don’t read unless you’ve seen the episode. Betty has to verbalize that particular platitude, of course, because when it comes to lying to oneself, no one does it better. But in tonight’s episode, every character is repeating this falsehood to themselves in one way or another. 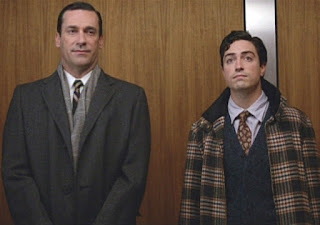 “Dark Shadows” is an ethereal, wandering episode of Mad Men, and while those are qualities some viewers will no doubt mistake for a lack of distinctive tone or thematic clarity, it seems to me a very deliberate creative choice. All of the characters are wandering at the moment, adrift in a sea of unhappiness and confusion as they try filling the voids in their lives. As in her only other appearance this season, “Tea Leaves,” Betty serves as the clearest representation of this theme. She’s started dieting, and is at least mildly successful at it, but she has little passion for her scant meals or Weight Watchers meetings. She’s wandering through them, unsure why addressing her weight isn’t making her feel any better. The issue is clear to the viewer, of course: Betty’s problem isn’t her weight. It’s what the overeating represents: a fundamental discomfort with her current lifestyle. And surprisingly, Betty starts comprehending this after a moment of insight – the buzzword of this season – at Don and Megan’s apartment. Entering that space to pick up the kids, she sees a world completely alien to her own: the living room is brightly lit, the furniture stylish, the atmosphere pleasant and inviting. It’s a stark contrast to the dark, cavernous castle of a house she shares with Henry. She sees Megan getting dressed, beautiful and comfortable in her own body, an image Betty desperately wishes to feel for herself. When the children show themselves, it’s clear they all feel more comfortable here, in the nice apartment with the younger maternal figure, than they do at the castle with Betty. In that moment, Betty sees everything she wishes she could have but doesn’t, and it deeply unsettles her. When she scarfs down Whipped Cream at home later that night, the dots connect, and she realizes for the first time how closely her personal dissatisfaction and recent unhealthy eating habits are tied. Even this obvious level of insight is a fairly big step for the typically repressive Betty, so it’s not exactly a surprise she doesn’t progress much further throughout the hour. She tries applying the Weight Watchers style of personal introspection and therapy on Henry when he expresses frustration about the campaign, which indicates she’s starting to come around, but in the meantime, she continues to struggle processing these complex emotions. 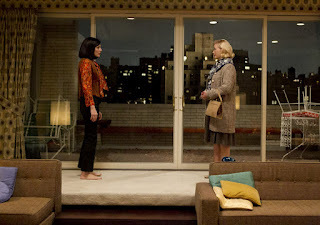 Bobby’s whale drawing makes her feel self-conscious, and the note on the back from Don to Megan reminds her of everything she doesn’t have, so she takes out her frustration by telling Sally about Anna Draper (a plan that gets the desired reaction out of Don, but thanks to Megan’s advanced emotional maturity, never comes back to please Betty). 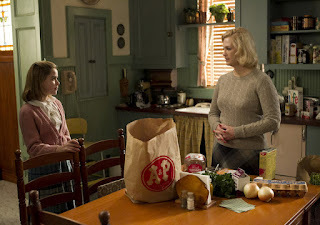 In the end, Betty decides to lie about being thankful – to herself, I think, more than anyone at the table – but the way January Jones (who was genuinely impressive throughout the episode) plays that scene makes me think Betty hasn’t completely spurned self-awareness. For once, she’s further along than her ex-husband. As I predicted last week, Don is a bit of a wreck without Megan in the office. That’s the void in his life at the moment – representing a large host of other emotional issues we shan’t get into here – and after noticing an absence of his own work in the SCDP portfolio, he decides to fill that void by returning to creative work. He’s genuinely impressed by Ginsberg’s output, and when he sees what strong material Ginsberg has ready for the Snowball pitch, Don tries to outmatch it. His ultimate idea, though – a half-formed concept centered around the devil and the worn-out ‘snowball’s chance in hell’ phrase – doesn’t live up to the Don Draper level of genius we’re accustomed to. It probably shouldn’t, given the amount of time that’s passed since he actively wrote copy (way back in season 3), and while the creative team recognizes these shortcomings for what they are, Don doesn’t want to hear ‘no.’ He’s probably aware, deep down, that this isn’t his best work, but he desperately needs to feel brilliant and useful to be satisfied at work without Megan, so when it comes time for the pitch, he stacks the deck by leaving Ginsberg’s work in the cab. Without competition, Don’s idea sells, but Ginsberg quickly confronts him in the elevator. “I feel bad for you,” he says, to which Don retorts “I don’t think about you at all.” That, kids, is what we call deflection, and a fairly textbook example to boot. Of course Don thinks about Ginsberg. In this episode, that’s just about all he can think about. Ginsberg represents the brilliant young ad-man Don is trying to rediscover, and having him around creates a professional contrast Don wishes he could ignore. But he can’t, and for now, the only way to fill this emotional void is with falsehoods, by favoring a sub-par pitch over an excellent one just to feel confident. 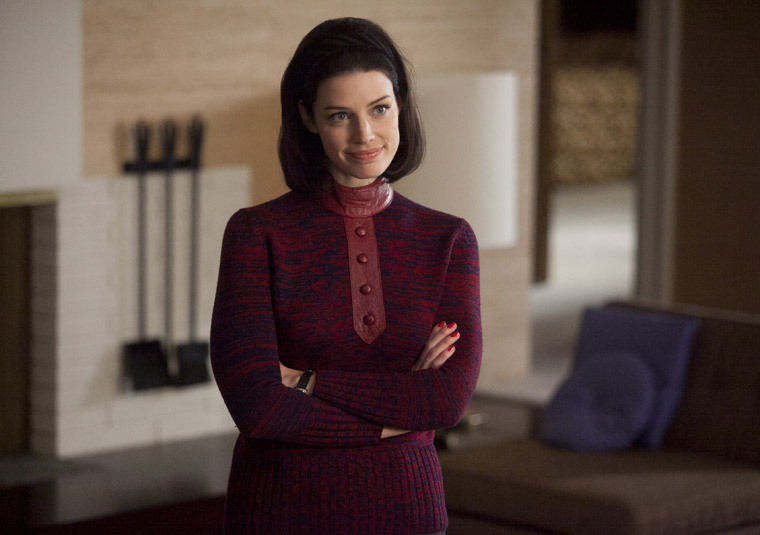 Jessica Parè as Megan Draper on "Mad Men"
Megan, meanwhile, appears to be doing some wandering of her own as she adjusts to her new status quo. She’s fairly well-adjusted in most circumstances, as we’ve seen near-constant evidence of this season, but as an exchange with her actress friend (who is auditioning for the iconic sixties gothic soap opera that gave tonight’s episode – and Tim Burton’s new remake – its name) underlines, Megan has voids of her own she needs to fill. She’s a creative person by nature, and an essential part of creativity is drive, the instinctual need to prove oneself through one’s art. Megan has that, but circumstance has greatly diluted it; she’s married to a wealthy man, and she’ll never have to work a second job or struggle for her art the way her friends do. Even if she succeeds, she feels that success will be cheapened by her financial security, and so, like Don and Betty, she’s a bit adrift at the moment. As always, it’s poor Sally Draper caught in-between all these dysfunctional parental figures, which brings out the pre-teen angst in full. Sally, as we’ve known for some time, is missing stability in her life, the ability to trust or have faith in her circumstances and loved ones. What sets her off tonight – learning Don had a wife before Betty – isn’t a huge deal (unless she were to hear the full story of Don and Anna Draper, of course), but it shakes Sally’s foundations enough to heighten every negative emotional she’s feeling. If her father hasn’t told her his whole story, can she really trust the one parent she’s always been closest too? If Megan left that important detail out, can she really be as perfect and pleasant as Sally typically views her? If Betty suddenly seems like the honest one of the bunch, what does that mean for life, the universe, and everything? Sally’s large jumps of thought are based in emotion, not logic, but nevertheless, she’s starting to process the world through a more mature prism. She’s sharper and more aware of her own emotions than Don, Megan, or Betty would ever think possible, and that catches all the adults off guard as she begins lashing out at them. When Don finally confronts his daughter, he starts by punishing a petulant child; but over the course of their conversation, he realizes Sally is closer to being a confused adult, and calms things down by speaking directly, as he would to someone mature. For the moment, that’s what Sally needs, and this particular situation is defused. But Sally has a lot of growing left to do, and all the adults in her life will need to continue adjusting to start filling the voids Sally so desperately misses. Pete and Peggy are more or less in a holding pattern this week, both continuing to experience problems they’ve been facing all season, but they nevertheless each had their share of good moments. Peggy’s finally starting to get worried about Ginsberg, as it becomes clear that no one – including Roger, who goes to Ginsberg with the same request he recently gave Peggy – is giving her the respect she deserves. There’s no major void in Peggy’s life as of yet, but if her job ever gets downsized or, God forbid, removed entirely, she’s going to be an emotional wreck. For the time being, she can comfort herself with the knowledge that she continues to get the best one-liners. Tonight’s pick: “Am I the only one who can drink and work at the same time?” Pete’s void, meanwhile, is just a general lack of satisfaction in all areas of his life, and he continues to fantasize about Alexis Bledel as he tries to assert himself at work, this time with a connection from the New York Times. When that falls through, Pete starts acting and appearing uglier than ever, and given the dark tone of much of this season, I shudder to think how much further he has to fall in the final four hours. Roger’s sub-plot, in some sense, is the most troubling of tonight’s stories. He’s, surprisingly, been the person this season who finally got things figured out, who had a moment of clarity after taking LSD and took steps to improve his life. But in “Dark Shadows,” he appears to be relapsing. Though he denies it has anything to do with Pete, he jumps back into competitively seeking a client, and just as he did many times in the season’s early episodes, loses a lot of money in the process (“I’ve got to start carrying less cash”). After “the most expensive dinner in history,” he even relapses in his sexual urges for Jane, taking her to the new apartment and making love. It’s a selfish, destructive action, one that completely ruins this new place for Jane. Inverting Betty’s final, false proclamation, Jane says “You get everything you want and you still had to do this,” putting Roger back on everyone else level, on equal footing with Pete, Don, Betty, and anyone else dissatisfied with their existence. I’d say it’s a damning moment for Roger, but he actually apologizes, proving that no matter what, he has learned something from recent experiences. Whether or not he’ll continue to strive for self-improvement, though? That’s anyone’s guess. That might as well be the tagline for the season. All of these characters have toxic air in their lives, and with each episode, it’s coming closer and closer. By the end of tonight’s hour, it’s nearing everybody’s doorstep. They can choose to ignore or confront it, but either way, it’s drawing ever closer, and I get the feeling that as we near the season’s end, a reckoning is at hand for all of them. I loled at the fact that you chose to write Alexis Bledel instead of her character's name because we all know shes not really acting. I think you favor Jane a bit too much. She's similar to Betty in a lot of ways; weak and resentful and fond of playing the victim. Jane could have easily said no to Roger at any time. I agree Jane didn't have to give in to him and she could have just as surely said no to him when he wanted to go to her apartment to 'see' it. What else did she think he had in mind especially after the client's son showed interest in her. He got jealous and wanted to establish his masculinity, and she let do it. So enjoyed your reflections on this Dark Shadows episode. The pot is definitely getting stirred for many of the charactere in one way or another. Waiting to see what more will be in store for Joan in the following episodes. Looking forward to next week and your thoughts.